More than 25 years ago, science writer Dennis Overbye wrote a book titled “Lonely Hearts of the Cosmos” that narrated the saga of the conflict in the extragalactic distance scale between Allan Sandage and Gerard de Vaucouleurs. The debate, which had raged for years, was finally cleared up in the 1990's by NASA's Hubble Space Telescope (HST) when accurate Cepheid distances were determined out to 20 Mpc for the first time. Now, 25 years later, the current value of the Hubble parameter H0 and age of the universe are known with an accuracy of a few percent. Jeremy Mould was a leader on the H0 Key Project Team that worked tirelessly to make the era of precision cosmology a reality today. It was therefore fitting that a conference on stellar populations and the distance scale be held in his honor. 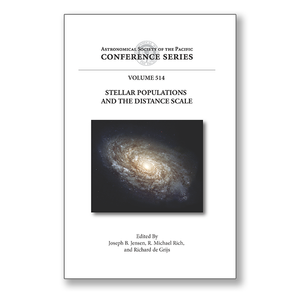 This volume contains contributions covering a range of topics including the properties of variable stars in the Milky Way, stellar populations in nearby galaxies, and the application of stellar population studies to the extragalactic distance scale and implications for observational cosmology.